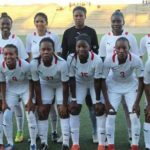 Namibia’s national women’s football team lost out on the chance to progress to the second round of qualifying matches to eventually participate in the 2020 Olympic Games after drawing 2-2 against the team from Botswana. At the end of the second leg of the qualifying round the team from Botswana progressed to the next round with an aggregate score of 3 – 2. The Namibians lost their away game in Gaborone over the past weekend with 0 -1. The second match that took place at the Sam Nujoma Stadium saw the Brave Gladiators’ defender Lovisa Mulunga scoring the opening goal for Namibia with team Captain for the match, Zenatha Coleman, finding the back of the net for a second time before the first half came to an end. Fungi Nondi Mahlasela pulled one back for Botswana to even out the score. She scored Botswana’s second goal a few minutes into the second half and the match ended in a draw. Botswana will now go on to face South Africa in the second round of qualifying matches for the 2020 Tokyo Olympic Games.